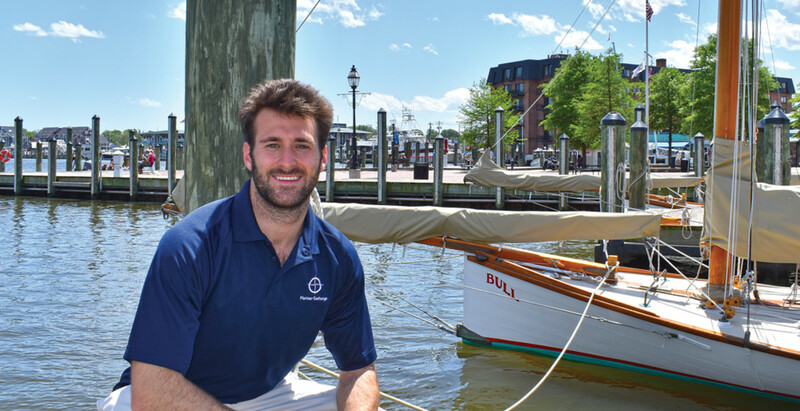 Alex Nicholson grew up boating in Annapolis, and worked at his family’s business, Fawcett Boat Supplies. By the summer of 2015, Alex Nicholson had decided that being a foreign exchange e-commerce sales analyst was not the career he truly wanted. The 2013 Dartmouth College grad had spent two years at Morgan Stanley. He enjoyed the technology aspect of his job, but the recreational boating industry had him at the end of a lifelong line. Nicholson, who is 26, grew up fixing outboards in the service department of his family’s business, Fawcett Boat Supplies in Annapolis, Md. He sailed at the Annapolis Yacht Club and has fond memories of days aboard his family’s 26-foot Boston Whaler Outrage. Nicholson does not yet own a boat, but he plans to buy one and it probably will be a sailboat. He frequently crews on a family friend’s Swan 51. Hungry for a career that could combine his passion for technology with his love of boating, Nicholson went to Montauk, N.Y., and walked to every yacht club and marina he could find, asking people where they got their boat work done and whether they were satisfied with the results. “I just kept hearing the same story about how difficult it was to find reliable marine repair service,” he says. It was the answer Nicholson was expecting to hear. He had become familiar with the problem while working at Fawcett. The recreational marine repair industry is fragmented. Some businesses work on engines, generators and fuel systems. Others offer electrical or electronic equipment and services, and still others do painting, graphics, canvas and upholstery work. Finding a good provider for each of those services can be a daunting task. Nicholson’s solution is the Mariner Exchange app. Its iOS version launched last July and an Android version debuted on March 20 this year. The Mariner Exchange marketplace connects boat owners with repair services, which is similar to what Angie’s List does for homeowners. After registering, users are taken to a screen where they can choose from nine categories, including engine/mechanical, electrical/electronics, structural repairs and exterior services. Clicking on a service within a category, such as upholstery under exterior services, and tapping “search” brings up a list of businesses within 50 miles that do that kind of work, along with crowd-sourced ratings and reviews. “There’s also an optional payment system, if you want to pay through the app,” he says. As Nicholson explains, the idea an entrepreneur starts with is often different from the business that eventually gets formed. He began with the Uber-style notion of sending marine mechanics to people in need of them. Mariner Exchange decided to focus on steering boat owners to quality service providers. “We wanted to focus solely on boat repairs, something the industry was desperately in need of,” he says. Nicholson says the app has had a strong positive response from boat owners. He is pleasantly surprised to see that they are staying on the app for relatively long periods of time. Nicholson says the app now has 10,000 users and is adding more at the rate of 300 percent a month. He says they range from people with 16-foot boats to the owners of 130-foot yachts. Nicholson says the new marketplace covers 4,000 companies in New England, the Mid-Atlantic states, Florida, California and the Pacific Northwest. Mariner Exchange is planning to expand to the Great Lakes region this month. Nicholson says he recruited and vetted the app’s first 200 companies himself, but users refer most of the businesses that now get listed on Mariner Exchange. Mariner Exchange does not charge boaters for using the app. It derives revenue from companies that list their services. Free listings are available, but they only include a company’s services and contact information. For $25 a month a business gets to submit a company biography and receive reviews from customers. Companies with reviews appear at the top of the search results. The company also builds websites for businesses that request it. Service providers that choose to bill customers over the app pay a 7 percent fee for the service. Nicholson is the CEO of Mariner Exchange, which has six employees — a chief financial officer, two engineers, a graphic designer and a salesperson. The company is upgrading its website, and at the end of May boat owners will be able to search for service providers and read ratings and reviews there. In June, businesses will be able to manage their profiles on the website and send invoices directly to boaters. Nicholson says an important service the Mariner Exchange app provides is the ability to tell marine service providers how many people are seeing their profiles and learning about their services. Mariner Exchange also can tell the providers how many phone calls, emails and website hits they are getting through the app.